In their weekly e-newsletter, Michigan Loves Manufacturing included a Press Release from the Ford Motor Company announcing its donation to the Red Cross for Hurricane Sandy disaster relief. Like many news agencies, this business journal doesn’t question such an action from one of the world’s largest auto companies nor do they see the irony. The irony is, one of the largest contributors to climate change, which is the real cause of Hurricane Sandy, wants to provide some “relief” to the victims. Ford, like the other auto companies, has a long history of contributing to pollution and climate change. The company has made massive profits from imposing a means of transportation on the public, particularly in the US, that has been one of the major contributing factors in climate change. The resource extraction necessary for the manufacturing cars/trucks is massive, the fossil fuels used to make cars/trucks is massive and the fossil fuels necessary to operate cars/trucks has all been a major reason why humanity is faced with the climate crisis we have today. The company also has a long history of climate denial. In 2006, there was a leaked memo stating that GM and Ford were both financing an ad campaign by the Competitive Enterprise Institute that was denying global warming. In addition, the Ford Motor Company has aggressively fought any regulations or higher emissions standards that the US government has sheepishly tried to impose on the auto industry. For example, in a January 12 letter to House Oversight and Government Reform Committee Chairman Darrell Issa (R-Calif.), Ford Motor Co. complained that California and 13 other states adopted stringent CO2 tailpipe emissions standards. According to Open Secrets, the Ford Motor Company has spent $107 million lobbying Congress on industry regulations and has contributed almost $10 million to candidates running for office since 1990. 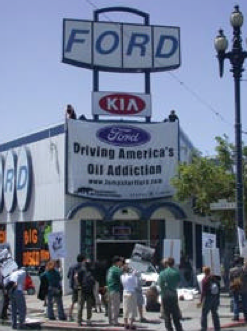 Some environmentalist groups have been bamboozled by the Ford Motor Company’s claim to be adopting green policies. The Sierra Club not only runs ads for the Ford Motor Company is its national publication, they even have been running a joint promotional campaign with the company touting their latest SUV the Mercury Mariner, which has a reported fuel efficiency of 33 city, 29 highway miles per gallon. Greenwashing attempts aside, the Ford Motor Company would in a sane world be tried for major environmental crimes and be listed near the top of the list of individual companies that has made billions off of environmental destruction and climate change. Then again, this should not come as a surprise, since the Ford Motor Company has a strong relationship with Nazi Germany and profited immensely from doing business with the Germans almost til the end of WWII.